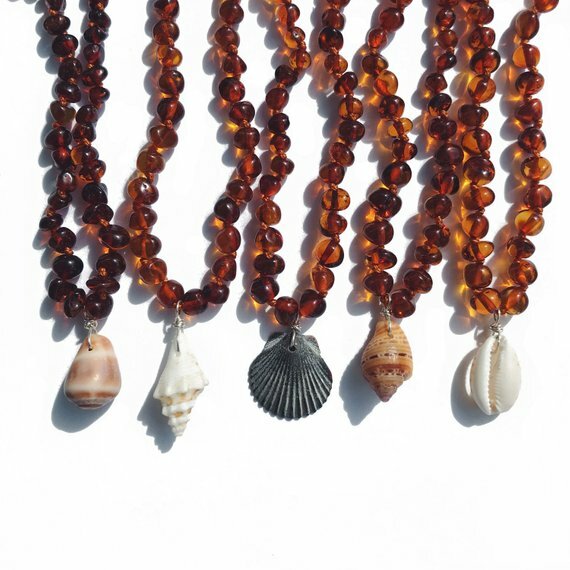 These beach baby amber necklaces are the perfect accessory for the beach baby in your life or one that needs calming beach vibes. After Lila started wearing her amber necklace the amount she drooled reduced drastically. We love these little necklaces & the shells add the perfect whimsical touch. Another reason why we love the tiny shells for baby accessories is because protection is a shell’s primary purpose in nature, as it is made to keep small, defenseless sea creatures safe from harm. Because of this, shells have strong protective energies. Many cultures in coastal areas use shells in folk magic to protect the home by placing strings of shells over windows and doors. Necklaces of strung shells can be worn by children to keep them close to home and safe from harm. Placing a small, round shell on the collars of your pets will keep them safe should they wander from home.